If you are considering divorce in Nevada, the Law Office of Thomas C. Bradley is here to help. Mr. Bradley has been practicing law in Reno, Nevada, for more than 30 years. He handles each case personally. He understands what a stressful and trying time this is for everyone involved and is committed to resolving all disputes as amicably as possible, but not at the expense of fairness to his clients. With Mr. Bradley as your attorney, you will have someone by your side who is a strong advocate who will fight hard for you. Mr. Bradley is not afraid to take your case to court and has both the skill and the experience to aggressively protect your rights throughout the litigation process. To learn more about the Law Office of Thomas C. Bradley and how we can help you, please call 775-323-5178 to schedule your initial consultation. We proudly serve the Reno and Sparks areas of Nevada. "My goal is simple: I aim to provide each client with the best legal advice and guidance to navigate the difficult legal territory of divorce. I believe that skilled legal guidance coupled with personal attention and a genuine interest in the welfare of my clients is of utmost importance. I prefer to work together with my clients to bring about a fair and favorable resolution in a timely and straightforward manner. I place a high value on honesty, and I expect others to live up to the same high standards of integrity." When you choose the Law Office of Thomas C. Bradley, you will be working directly and exclusively with attorney Thomas C. Bradley. Other firms often make references to “your legal team” and it can sound very impressive, but it usually means handing off your case to junior attorneys or paralegals and minimizing your access to your lead attorney. That is not how we work. Mr. Bradley will personally handle every aspect of your case. He will give you as much one-on-one time as you need. When you have questions, you will speak directly with Mr. Bradley and he will take the time to answer your questions thoroughly in terms that make sense to you. Mr. Bradley will be by your side every step of the way, from initial consultation, through negotiations and at trial should your matter require it. Thomas Bradley graduated law school and became licensed to practice law in Nevada in 1984. He has been practicing law in Reno for more than 30 years. Early in his career, he served as the only federal public defender in Reno for five years. 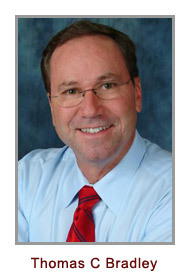 He has been in private practice since 1995 and has practiced family law for 20 years. Mr. Bradley has extensive trial experience and has represented clients in over 100 mediations. Mr. Bradley understands the fine balance required for a fair and favorable divorce. He is committed to resolving all disputes when it is possible to do so in a way that benefits his clients. In fact, Mr. Bradley has often been able to settle tough cases and avoid the need for long-drawn-out and expensive court battles. He is a skilled negotiator who gets along well with people, which helps to reduce the levels of acrimony and bitterness often present in divorce cases. Most important, he is committed to helping his clients settle their cases on favorable terms. He also understands that there are many cases where settlement is not possible or in your best interest. In these cases, he has the skill and trial experience to aggressively protect your rights throughout the litigation process. Mr. Bradley knows when to advise his clients to fight hard for a fair deal. Often, when the opposing side realizes that you will not accept a less than fair resolution and are not afraid to take the case to trial, they come forward with substantially improved settlement offers. If live in the Reno or Sparks communities of Nevada and want to learn how we can help you, please call the Law Office of Thomas C. Bradley today at 775-323-5178 or email us to set up your initial consultation.